In 2004, a Marke Trak survey showed that 31.5 million people in the U.S. had reported a hearing loss – almost 10% of the U.S. population. The breakdown of those results showed that 1 in 6 baby boomers (ages 41-59), and 3 out of 10 people over 60 have hearing problems. Common signs of hearing loss are: having to ask someone to repeat what they said often; having difficulty following a conversation when more than one person is speaking; people sound like they mumble when they speak; having difficulty hearing in noisy places like restaurants, or meetings; having trouble hearing children and/or women’s voices; turning up the TV too loud; having ringing in your ears; or finding that you intently look at a person’s face or lips when they speak to you. If you or someone you know falls into any of these categories, then a hearing loss may be to blame. There are also emotional tolls that affect the hearing impaired – withdrawal from society, stress, and nervousness from misunderstanding a conversation. My family doctor would have told me if I had a hearing loss. Only about 14% of doctors screen for hearing loss during a physical exam, and since a lot of hearing impaired individuals can hear ok in quiet rooms, like a doctor’s office, the doctor may not notice the problem. Hearing loss is normal for my age. If you had trouble seeing wouldn’t you get glasses? If you had high blood pressure, wouldn’t you take the precautions necessary to treat that? Hearing loss is treatable as well. The upside to wearing hearing instruments includes better relationships with loved ones, a better sense of control of life events, a more active social life, and a reduction of paranoia, self-criticisms, and anxiety. Hearing instrument technology has improved over the last few years. With digital computerized hearing aids we can now amplify the soft speech sounds without amplifying the loud annoying sounds. Also, open-fit technology has vastly improved the comfort of wearing hearing aids. May is better hearing and speech month. Take the time to help yourself or someone you know. For the hearing impaired there is a better quality of life to live. A good first step is to be evaluated by an audiologist or a hearing instrument specialist. Take that first step. It may transform your life. 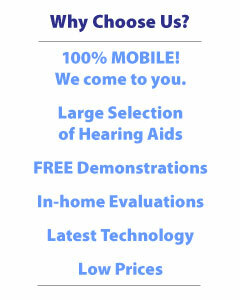 For more information on hearing aid services call (480) 735-9234.